At the beginning of 2015, Helen Flockton, Director at W T Knowles & Sons got together with 4 close friends to raise awareness for “Breast Cancer Now”. The easy part of the plan was setting up the “Just Giving” web page and deciding on the challenge – a bike ride being the most popular choice. 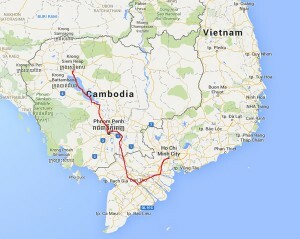 Suggestions ran wild and then the realization dawned on the group of the daunting ride they had chosen, a 540km 8-day challenging cycle from Ho Chi Minh City in Vietnam to Ankgor Wat in Cambodia. Few of the group were experienced cyclists which made the challenge even more daunting but armed with a large slice of traditional “Yorkshire grit”, the girls trained in the local hills before setting off from Heathrow on 3rd October to join a large group of other cyclists, all riding for their chosen charities. What a shock awaited the team with temperatures in the mid 30ºC’s and in 90% humidity at the start of the rainy season. If day one was a gentle introduction, out of the city, to the famous Cu Chi Tunnels and onto Can Tho, day two was an earnest 90km ride past canals and Khmer Temples and into the driving rain as the monsoon’s began. Wet weather riding became the norm but didn’t detract from the wonderful sight of the floating market and bird sanctuary as the kilometres melted away as Vietnam was conquered by day 4. Helen had taken note of the familiar bottle kilns and brick works along the way and wondered if the ox drawn carts would be the latest transport option for W T Knowles! Into Phnom Penh, Cambodia on day 5 via the infamous and sobering “killing fields” before another 75km day dawned, past the horrific Khmer Rouge “School 21”, down rich red roads and past endless paddy fields as the monsoon rains brought day 6 to a welcome end. After a 5-hour boat ride crossing the immense Tonle Sap Lake the group rested in Siem Reap before the final days’ cycle into the famous world heritage site of Ankgor Wat. 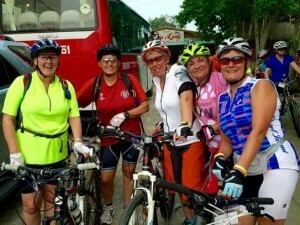 540km covered over 8 days raising over £6,000, Helen and the “Five Old Ladies” team had overcome their personal challenge to help others achieve theirs. Along the way the team was enriched by the wonderful heritage sights and the warm welcome from the local community whilst not losing sight of the good cause this was done in aid of. “This was a very emotional and thought provoking trip. The whole team were self funding and yet still managed to raise over £6,000 and the donations are still coming in. Coupled with the fund raising was the training and I’m sure that we all had doubts as to whether on not we would be able to complete the challenge but we all did, with a certificate to prove it, despite the AKA name!